As far as embedded narrative goes, Super Mario Galaxy is extremely weak. There is no spoken dialogue throughout the entire game, there is no development of the main protagonist Mario, and there are zero side-characters. Even Luigi has yet to make an appearance as far as I have played. All interactions between Mario and other characters is illustrated through dialogue boxes accompanied by funny sounds. 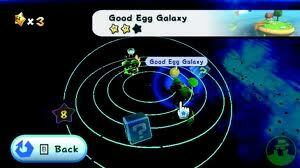 Ultimately, Super Mario Galaxy does not have a deep or intriguing story, but neither does any Mario game to date. The setup always remains the same: Princess Peach is captured by Bowser and Mario must find ‘power stars’ that help in some fashion get closer to Princess Peach. The means by which Bowser captures Peach and the means by which Mario has to rescue her slightly change. For example, in Super Mario Galaxy Mario has to collect ‘power stars’ to give energy to an observatory that can take him to Bowser. In Super Mario 64 Mario has to collect ‘power stars’ that controlled Princess Peach’s castle, after getting a certain number of ‘power stars’ Mario earns access to a new part of the castle. In the end, however, every Mario game always ends with Mario saving Peach. Emergent narrative in Super Mario Galaxy has slightly more wiggle room if only for the fact that unlike embedded narrative, emergent narrative is actually present in the game. Since the game is largely linear, emergent narrative involves the player choosing how to maneuver Mario through an environment. 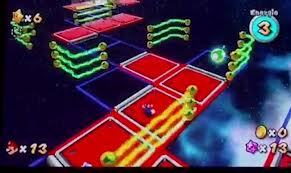 While the player really only has one option for how to traverse a level, no attempt through a level will result in an exact replication of the previous attempt. Every level has a multitude of moving parts such as enemies, moving platforms, and changing gravity that cause the player to think on their feet each playthrough. In a sense, Super Mario Galaxy takes the exact opposite approach of L.A. Noire. Whereas L.A. Noire focuses almost completely on narrative and suffers from a lack of engaging game play mechanics to engage the player with the games narrative, Super Mario Galaxy focuses almost completely on game play and suffers from a lack of meaningful story to engage the player with the games game play. During my play of Super Mario Galaxy this week I found myself becoming disengaged with the mechanics that had hooked me during my previous two play sessions. Eventually I realized that I was becoming bored of the game because the goal, obtaining a star at the end of each level, was becoming repetitive. Unlocking a new galaxy was no longer enough of an incentive to keep me intrigued. Additionally, while the game play had more variance than many other games that I have enjoyed playing more than Super Mario Galaxy, without any sort of narrative reward for my accomplishments the game play started to feel more like a grind than a fresh experience with each new level I unlocked. For these reasons, more time with Super Mario Galaxy is not something I would refuse but neither is it something I am particularly looking forward to as I am with other games. Blasphemy! This and Galaxy 2 are in my top 10 games of this generation.